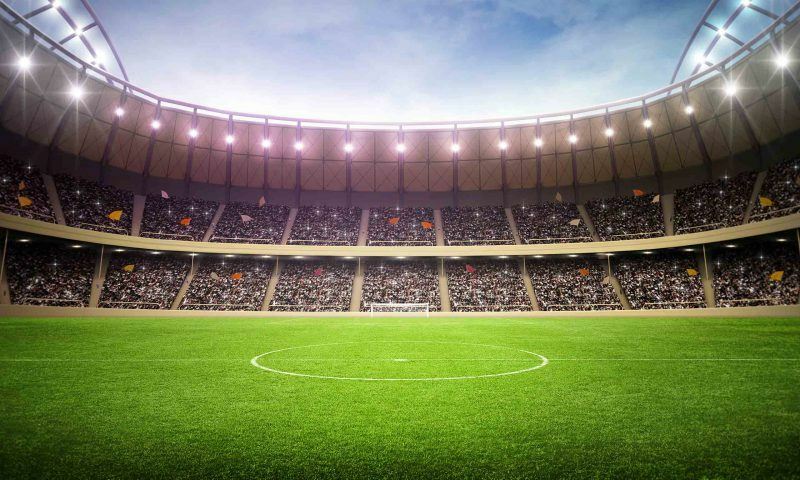 Coaches in professional sports have more technology at their fingertips than ever before. In 2018, it is possible to track virtually every aspect of an athlete’s fitness, training and performance. The aim is to put the individual, and ultimately the team, in the best position to succeed. Applied correctly, the advantages can be huge. 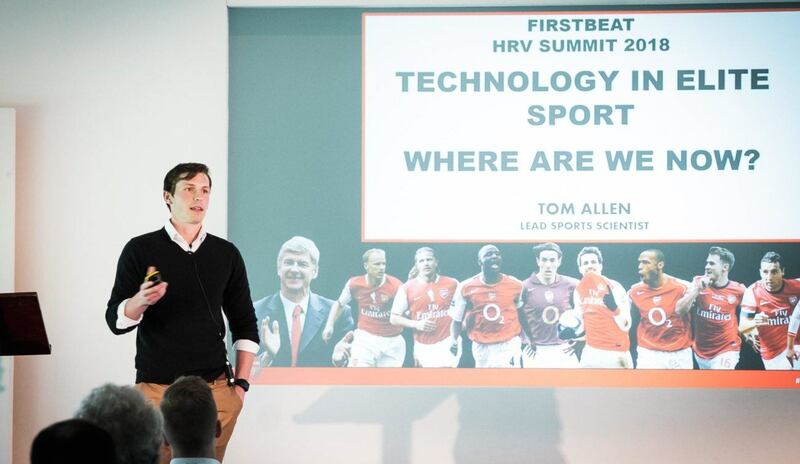 Just how to do this effectively at the elite level was a subject broached by Arsenal Lead Sports Scientist, Tom Allen, at Firstbeat’s recent 2018 HRV Summit. Speaking to a packed room at Lords Cricket Ground in London, the key note speaker recounted football’s evolution from the “who needs technology, we just work hard” philosophy, through to the modern day where Arsenal are using multiple platforms and devices to measure virtually every possible metric in the pursuit of peak performance. “You name something and we’re probably measuring it in some form,” said Allen. 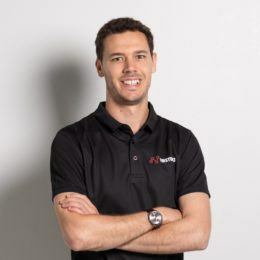 Allen has just finished his first season at Arsenal and his role at the Premier League club involves monitoring and practically applying data into on-field conditioning for the first team squad. He offered an incredible insight into just how this is done at one of the world’s top football clubs. 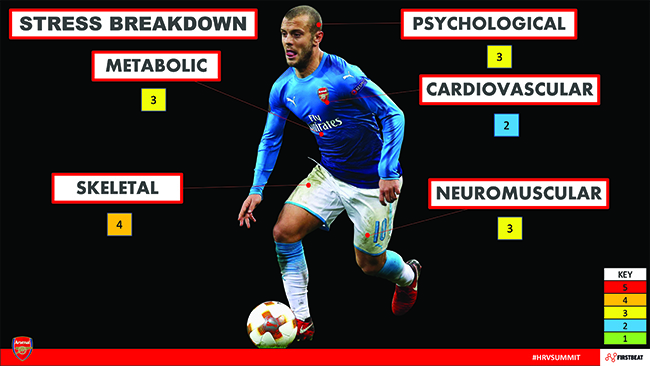 Using Firstbeat Sports’ heart rate variability (HRV) data alongside GPS, wellness questionnaires and more, Arsenal cover all the bases when it comes to monitoring the squad throughout the season. Inevitably, this level of in-depth analysis means Allen and Arsenal’s support staff receive thousands of data points daily on each member of the team – from Petr Cech to Pierre-Emerick Aubameyang and everyone in-between. “We need to find a way of collating that information because more technology is being created every single year,” explained Allen. “There has to be a signal we need to find, we don’t just want to be running through loads of data. 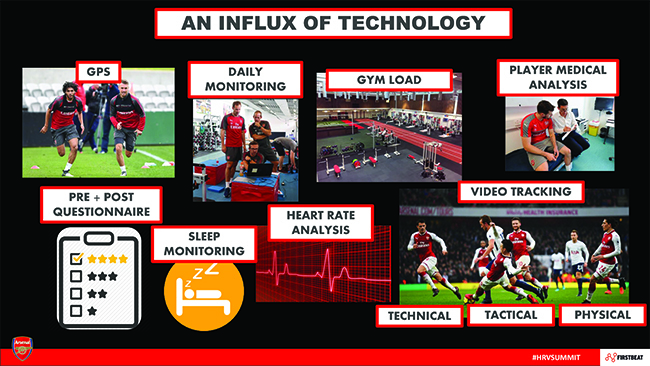 So, how do Arsenal make sure the manager only receives the relevant information amongst the mass of data that comes from training, gym work and during games? “We created a database that provides a story for us to tell about a player, and every manager I’ve worked with likes to see the story,” says Allen. This particular story centers around stress. Specifically, the five categories of stress that are scored on a 1-5 scale based on the data collected on each individual player. There is; Skeletal Stress (stress on the skeleton through speed/distances). Metabolic (acceleration/deceleration). Cardiovascular (heart rate analysis through Firstbeat variables). Neuromuscular (how the muscles are responding). And Psychological (the athlete’s wellness). This process allows Allen and his colleagues to see each player’s risk of injury and chance of peak performance at any given time throughout the season. 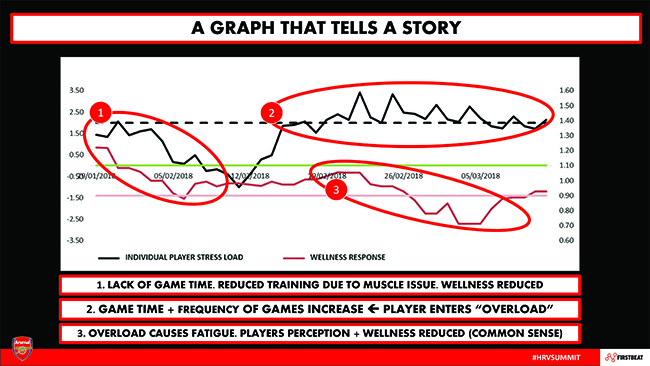 To make this as clear as possible to the manager (and players when shown their own data), Allen and his team create a graph highlighting the load and wellness of each player over time. 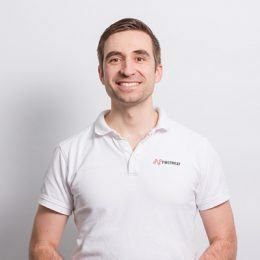 “(For load) we take the thousands of different data points from different sources of information like Firstbeat and gym load and we highlight, using a dotted line, when there is statistically significant more stress than previous,” says Allen. Scoring above the dotted line is not a cause for concern in isolation. However, if a player ranks above the line for a prolonged period then it signifies overload and may lead to changes in their routine. Wellness is tracked on the same graph. This is done through 35 measurements largely taken from wellness questionnaires and physical tests and shows how the player is responding to varying loads. Allen revealed one example of such a graph and how it informed them on a player’s situation throughout February 2018. Stage One – Player is complaining about an ankle issue so training load is reduced. Wellness score also drops as he is reporting more soreness. Stage Two – By mid-February, there is a gradual increase in load and wellness as player returns to training and game environment. However, due to the high frequency of games at this time, player enters a state of overload. Stage Three – This overload causes wellness to drop. Under more load and stress there is a reduction in readiness, increase in soreness and reduction in ability to produce movements in screening profile. Arsenal deploy one more tactic to help turn this data into something actionable on the training pitch. 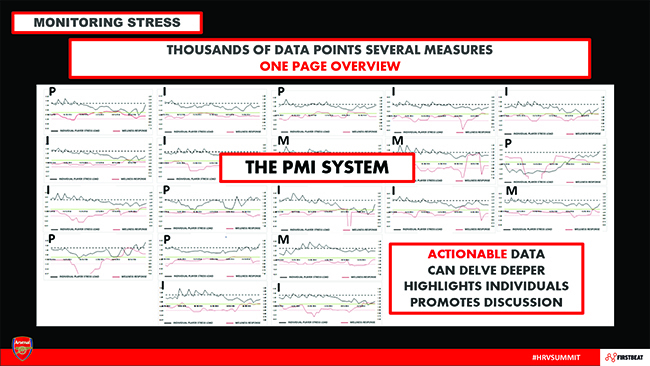 The PMI System, named after the three categories within the system, means one of three letters are assigned to each player depending on what the data shows. P for ‘Protect’ – Individuals who are either at increased risk of injury or in a state of overload. These players would not be pushed physically during training due to overload and poor wellness combination. M for ‘Maintain’ – Have experienced previous state of overload. Could prolong recovery phase before pushing hard. I for ‘Increase’ – No state of overload in recent weeks. It is possible to push these players hard due to freshness. Taking a player in the ‘I’ group as an example, Allen looked at the underlying data. Reviewing the five stress categories, they can design a training plan based around which areas need working on. For example, high speed runs with reduced work:rest ratio are added to the week’s plan for a central defender with low skeletal and cardiovascular stress scores. If work on the neuromuscular category is also required, then these runs would take place when fatigued. With technology in sport accelerating at such a rapid rate, an understanding of which data is important, and why, is crucial. 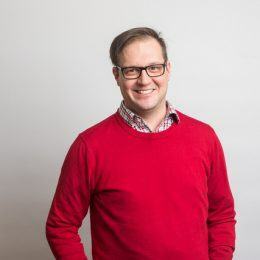 This can be done through education and, as we have seen, by putting in place an effective system that pinpoints the data relevant to the ultimate team objectives. 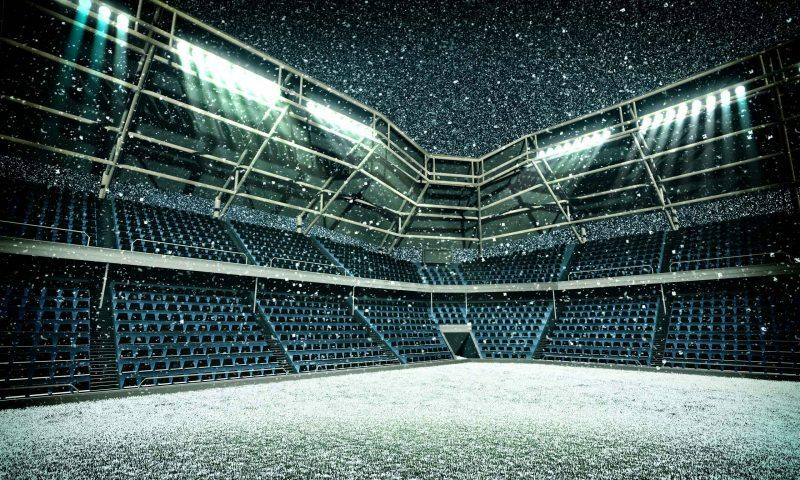 While the Premier League is still going strong, the majority of the European soccer leagues are heading to the winter break during some of the coldest months of the year….